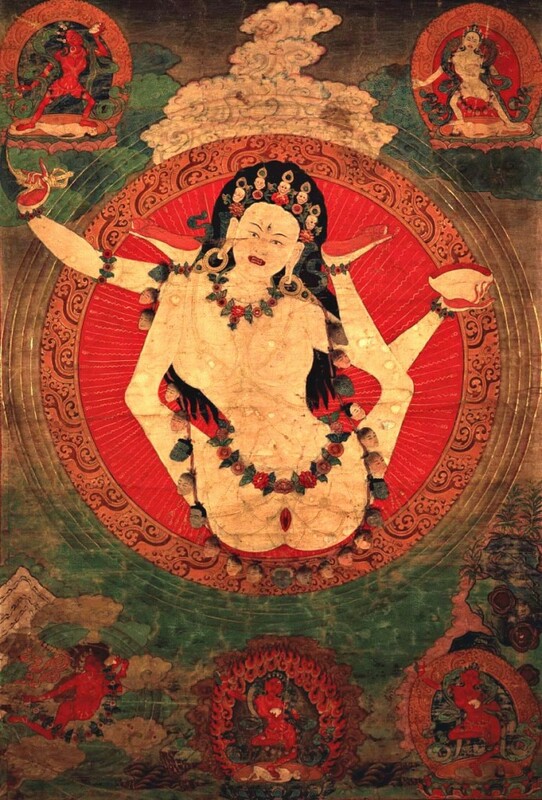 Like the blue flame that burns the hottest, the Dakinis represent a most empowered form of the enlightened and sexual feminine… For these fully-divine-realized, Goddess-Nymphs of Asia, to be in complete fluid embodiment of their sexuality and to be enlightened went hand in hand. They were one path. Unashamed, unafraid, uninhibited…shameless, fearless, wild and free, the Dakinis were masters of both energy and embodiment. They lived in this realm and in others simultaneously and were able to be fully present and manifest in each. They were able to carry the light transmissions from these other lands to this one, and able to transmute emotion and sensation into the pure light of awareness. Their path was not one around or beyond these feelings and sensations but through them, and to them in their most spectacular realizations. It was through passion, through fire, through fierce commitment to the whole experience of the self, that they accessed their powers.